No matter what stage of life you’re in, it’s so helpful to have a daily schedule and routines that help your day flow more smoothly. Today I’m sharing what’s currently on our schedule. 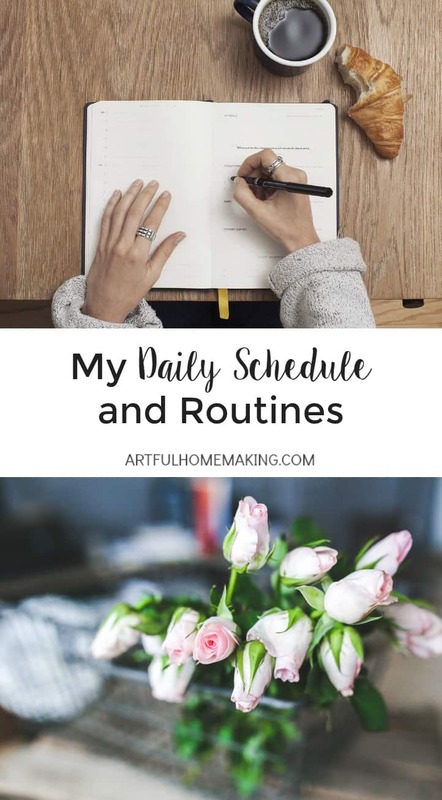 After I shared about my new homemaking binder the other day, I received a reader request to see my actual schedule and routines. I know how helpful it can be to look at the way someone else has their day set up, so I thought I would share mine here. Keep in mind that these schedules and routines are my “Lord-willing” plans, and not every day goes according to plan or schedule (Not.At.All). Especially not this summer–I’ve hardly had one day that was predictable or scheduled. I’m hoping next month will be calmer and we can get back to our usual schedule, even though it’s nice to have a break from the schedule sometimes, and we’ve enjoyed some unplanned and spontaneous fun this summer, too! The Friday schedule is similar to the above schedule, except that we clean the house during the usual school time. Everyone has specific chores for Friday’s Cleaning Day. My goal is also to have an art project planned for after cleaning time. We usually use Fridays as Family Night, and the goal is to plan something fun to do together that night (games, watch a movie, etc.). We also love to make homemade pizza on Fridays. Make sure lunch and dinner are planned and meat thawed. Living room–pick up and put away things: toys, dishes, clothes, shoes, etc. Think about meals (check menu) and get out ingredients to thaw. Brush teeth, wash face, etc. As I mentioned at the beginning of this post, the schedule and routine I’ve shared here is the way I’d like for each day to flow. But it often usually doesn’t work out that way. Still, I find it helpful to have a schedule in place to give me something to aim at. Don’t get discouraged if your schedule doesn’t work perfectly! Mine never does, and I’ve been making schedules for the past fifteen years! Some days I’m able to stay on schedule (here’s an example of one of those days), and other days I just have to go with the flow. Sometimes the schedule doesn’t work because it needs some adjustments. Recently, I realized I was trying to get up too early. It just wasn’t working. Life has been crazy, we had been staying out late at various social functions, and I had been struggling with adrenal fatigue. I realized it was better to just get up later and feel rested than trying to force myself to get up at a super-early time that worked for me when I was young, single, and childless, but doesn’t work too well now. Make a schedule that reflects your life and priorities. I’ve got two teenage daughters who make breakfast every morning. I’m blessed, right?! Your children may be younger, so you may need to be in charge of breakfast at this time in your life. If you’re suffering with morning sickness, right now a strict schedule probably won’t work for you. Don’t compare yourself to someone else, be thankful for the blessings in your life right now, and make your schedule/routine work for you. I schedule things into my life in an effort to accomplish my most important goals and priorities. Like spending one-one-one time with my children, having daily read-aloud time, etc. Somehow putting it in the schedule gives me a tangible way to get closer to accomplishing these goals. Even if I don’t accomplish all of my scheduled goals every day, at least I’m accomplishing more than I would without the schedule! I hope this is helpful to someone. 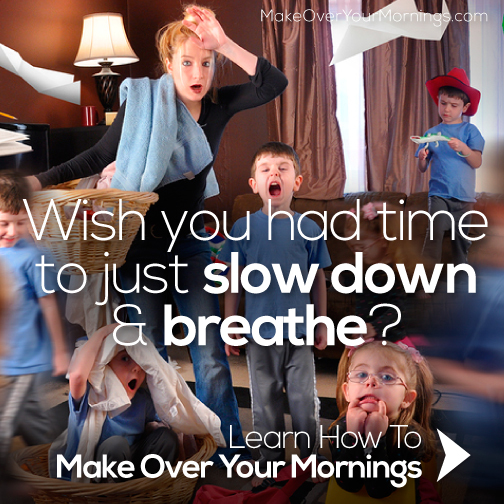 If you need more help and encouragement, I love Crystal Paine’s Make Over Your Mornings 14-Day Online Course. It’s very motivating! Disclosure: This post contains my affiliate links. Read my full disclosure policy. Sharing here. My New Homemaking Binder + A Planner Giveaway! Wow, that’s a lot of cooking! We try to choose less time-intensive recipes for most of our meals (except for special occasions), and then we all take turns cooking, so that saves a lot of time. I have enjoyed this post very much, as well as the post on your Homemaking Binder. It is so nice to see what other homeschooling moms are doing. Thank you, Myra! So glad you enjoyed it! I schedule our months with a simple monthly planner I got from Dayspring and our daily schedule is more of a routine…it isn't super time set. I would love to become more organized in our days, though. I need to be more intentional! A routine is great, too–whatever works best for your family! It's a constant quest to be more intentional, isn't it? I know it's something I'm always working on and praying about. 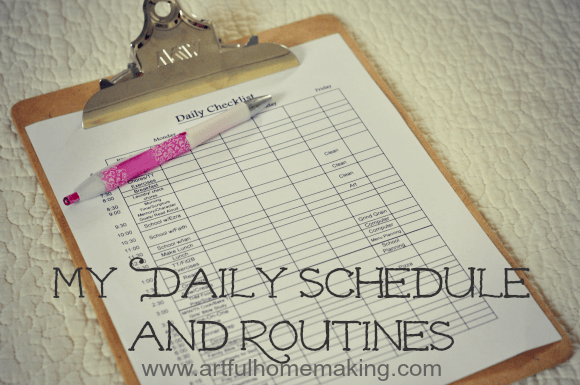 Do you have a daily routine schedule form? I am not good at making them and I was wondering if you had that. I love the clip board and check off idea. Schedules are great, especially for our younger children. Though my schedule isn't as well thought out as yours, I do keep my daughter's sleeping/eating to set times (or close to those times) and it works beautifully. I did notice, though, while on the schedule everything is great but once we deviate from it, it seems to make life harder for her/us sometimes. But that's ok, we all have to learn to "go with the flow" eventually (and I'm still learning, too). Thanks for sharing your schedule, it is nice to see other people's schedules and plans and to have them as a base to start with for your own.